The Detroit Auto Show is alarmingly empty this year, without brands like Mercedes, Jaguar, BMW, Porsche, Audi, Mazda and more to fill up the show floor with sheetmetal. To make it seem less awkward, organizers filled up the space with a field of stickered and wrapped whips, and they overdid it. The Detroit show has felt like it’s living on borrowed time for a few years now, and it’s scared the city so bad they decided to move it six months later to June starting in 2020. That makes this year’s auto show the last to happen in Detroit in January, probably forever, which is a good reason for a lot of notable automakers decisions to skip. The tuner cars aren’t even particularly cool. It’s just dozens of scattered Corvettes, BMWs, Infinitis, Porsches and whatever else you can think of, all serving as standing ads for wrap companies, paint shops, tuners and dealers. The entire spread takes up what would normally have probably been about four or five separate automaker stands. Instead of some metropolis of shiny new cars, that whole chunk of the show floor feels like a wasteland. It’s spooky. Here’s hoping the move to June turns things around for the Detroit show. 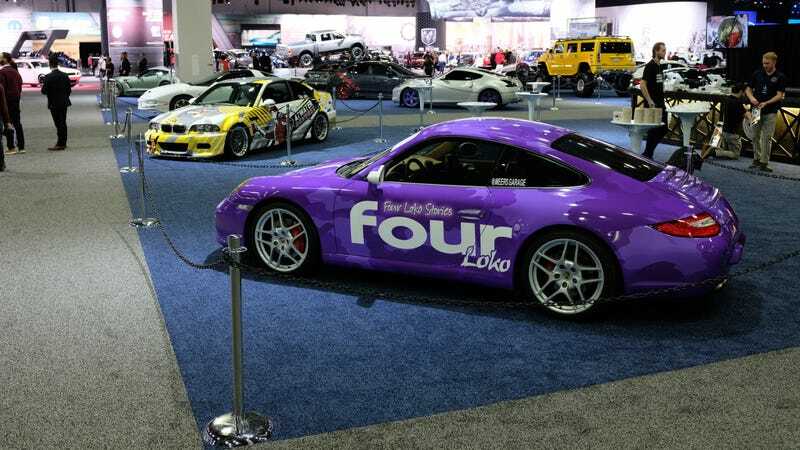 I’m not sure it can survive anymore of the Four-Loko branded 911s.